Owning your own home can be worrying. When you leave the house for work in the morning, you might get struck with a nagging feeling that you left the coffee maker on. Today we’re touring a smarthome designed to alleviate those pesky thoughts. 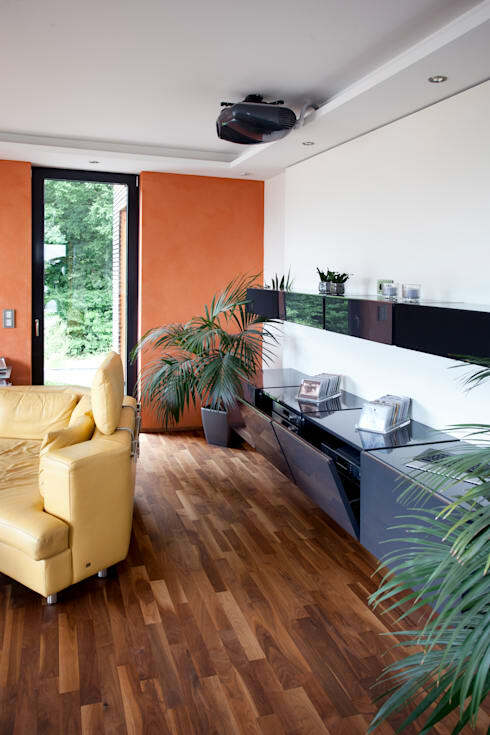 A smarthome will share information with you about the systems and devices in your home! All you have to do is use an app on your phone. It’s not a science fiction concept and it’s not reserved for Bill Gates, either. 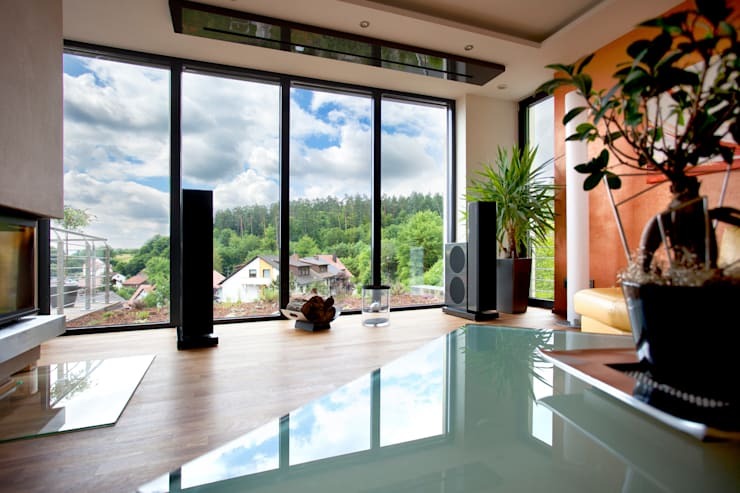 The professionals at Klaus Geyer Electronics souped-up this home with a sophisticated remote control program. It’s perfect for a tech-savvy family who needs to be connected at all times. We’ll see warm modern interiors cleverly integrated with smart tech to make life easier and more handsfree. Ready to check out some intelligent living inspiration? Rather than a cool and unfriendly building, this home has a warm and inviting atmosphere. The cheerful white exterior has wood plank accents. An abundance of large picture windows lets you take in the fresh green landscaping around the home. There’s a sleek outdoor terrace on the main floor of the home where you can eat alfresco and take in some sun on a warm day. The design is intelligent as well as stylish. Solar panels on the roof feed power into the grid so the home can heat its own water. An investment like this might seem steep upfront, but it will always save you money in the long term. 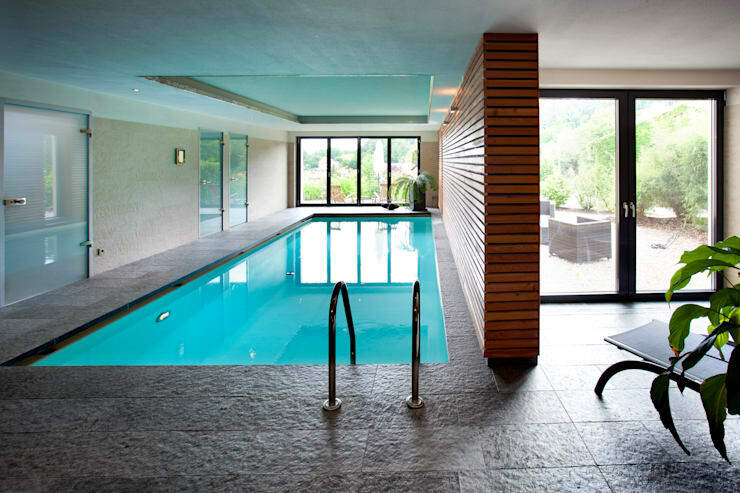 The ground floor of the home is reserved in part for this amazing swimming pool. We love the natural textures and bright natural light in this room. The swimming pool hides a smarthome secret; there are cameras installed so you can keep an eye on kids in the pool while you’re upstairs! With such relaxing ambience, the pool is sure to appeal to adults, too! 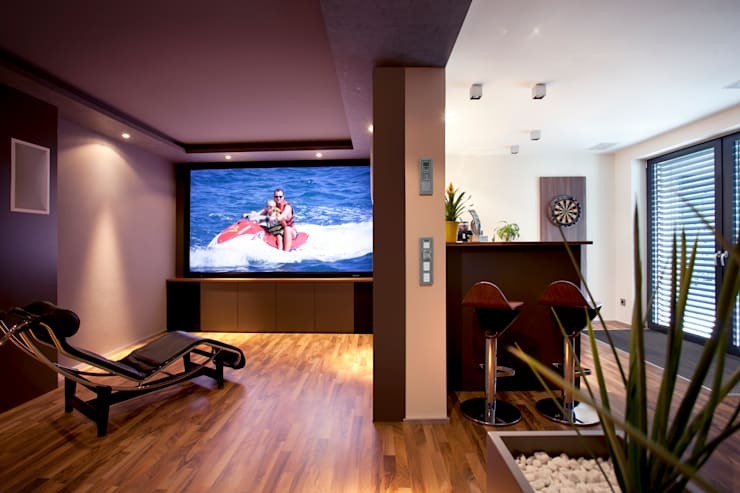 This recreation room has a home theatre and entertainment system. A masculine bar and lounge area creates a fun place to hang out on the weekends and after dinner. Need to shut the blinds, but already comfortable in your chair? You can use your phone to pull down the blinds, dim lights, and turn on the projector. Movie nights will never be the same. 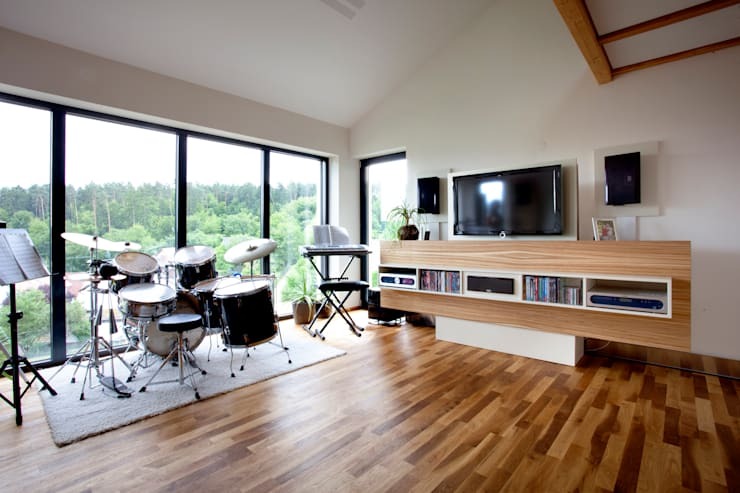 This jam space has a drum kit and entertainment system to keep the inspiration rolling late into the evening. Check out the wood grain on the shelves and on the floor. These wood touches bring character and modernist style to the room. This is a great place to let off steam and get creative! 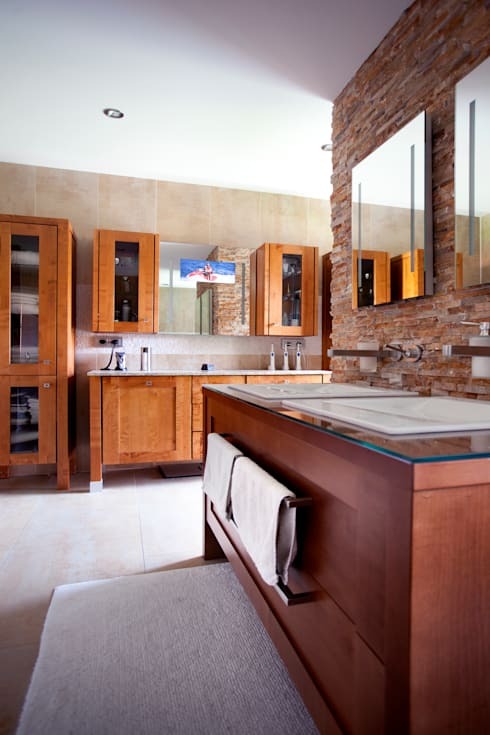 Wood, stone, and glass come together to create a bathroom that’s an update on a traditional design. This massive bathroom might have gone overboard on the smarthome theme. There’s a T.V. screen in the mirrors! Maybe it’s helpful for keeping up with the news while you floss your teeth. A tablet on its stand in the kitchen is a simple command central for the smart home. You can adjust lighting, home security, entertainment, and the thermostat from your devices. The kitchen feels connected to the dining room and living room. We love the industrial style of the staircase. The kitchen island is fully loaded with an induction stove and double sink. The counter has a black countertop with white minimalist cabinets. 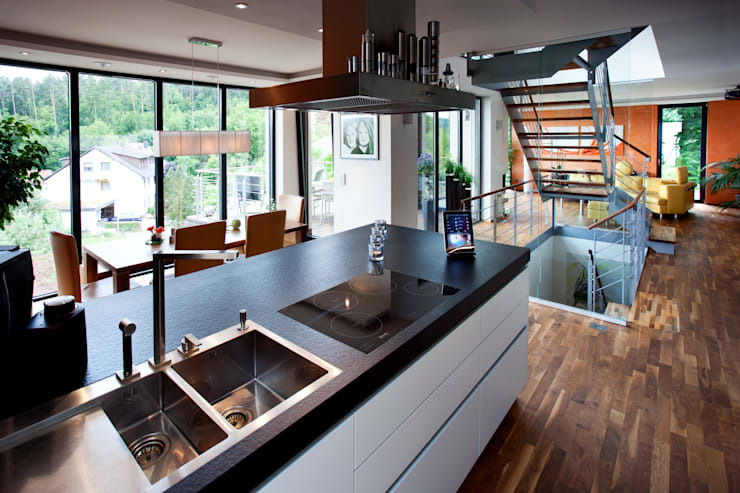 This high contrast design brings a futuristic look to go with the smart kitchen. Punchy shades of tangerine and lemon liven up this retro-chic living space. 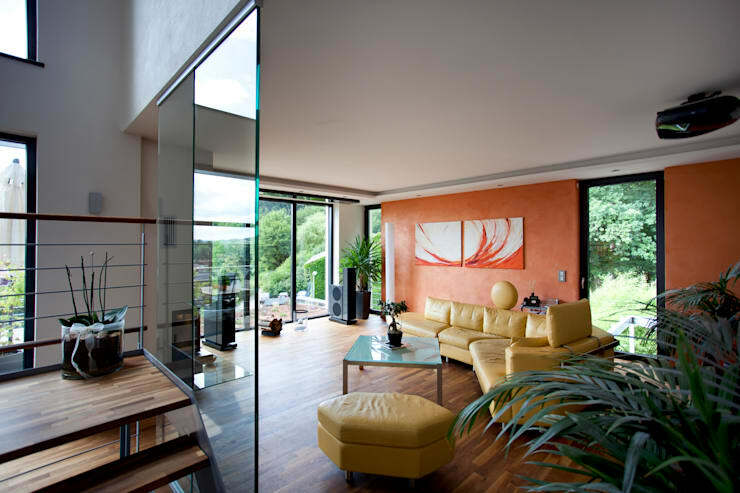 The rich wood floors extend to the full height windows and elongate the room. Potted plants bring a tropical vibe to the room that we love. It reminds us of the fancy foliage we saw in the swimming pool area. In this corner of the living room, we’re enticed by the sophisticated storage solution. Floating cabinets create a shelf for succulents and candles to bring ambience to the room. The cabinets on the ground conceal an entertainment system that provides the home with tunes in every room! You can see the entire sound system and from the ceiling would drop down the screen for the projector. Whether you’ve turned on the projector or you’re simply enjoying the view, this living room is the ideal place to relax. Nothing beats a view of verdant trees and puffy white clouds! We hope you enjoyed our tour of this souped-up smarthome. We can’t wait to get an app for our coffeemaker! 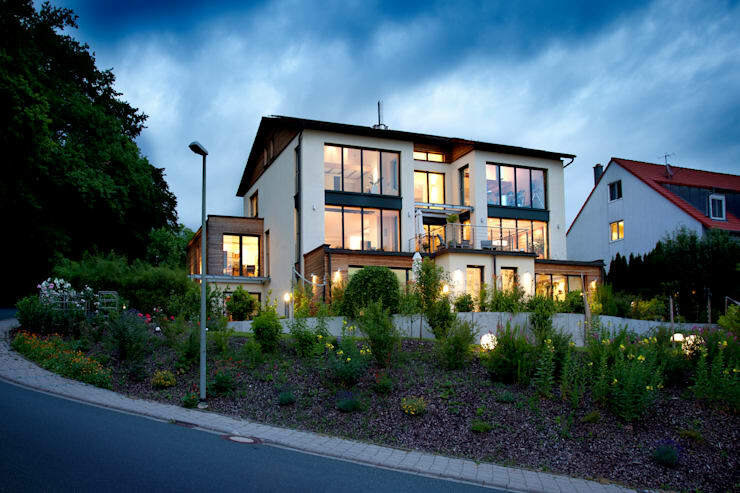 Next, check out this modern country home that's shaped by the rolling hillside! Do you think you'd want a smarthome?